Until two years ago, not many people would have bet on Honor. Not that many people would buy a smartphone from the brand. Honor, however, seems to have understood exactly what users want: the Honor 10 is the answer, the smartphone that currently offers the best value for money without giving up (almost) anything. Smartphones are nothing new anymore. We are used to having them in our hands and pockets and we’re hardly impressed to see yet another hit the market. The Honor 10 cannot be defined as the exception to the rule, but it does stand out from the crowd in the Phantom Blue and Phantom Green versions. The two vibrant colors were created at the Paris Aesthetics Center, an international fashion institute for leading design professionals, which doesn’t go unnoticed thanks to the pleasant light effects created by the 3D glass on the panel. This design is created through a process that employs 15 layers of 3D glass capable of reflecting the changing colors. If you’re fascinated by the Huawei P20 Pro’s Twilight version, you’ll immediately be tempted by the Honor 10 in blue and green. Black smartphones have become boring. The front panel is almost entirely occupied by the FullView display and an integrated ultrasound fingerprint sensor under the glass. The notch? It’s there, but you can deactivate it. Today’s technologies and trends have been taken into consideration and have their appeal, but users also have the option of disabling them. 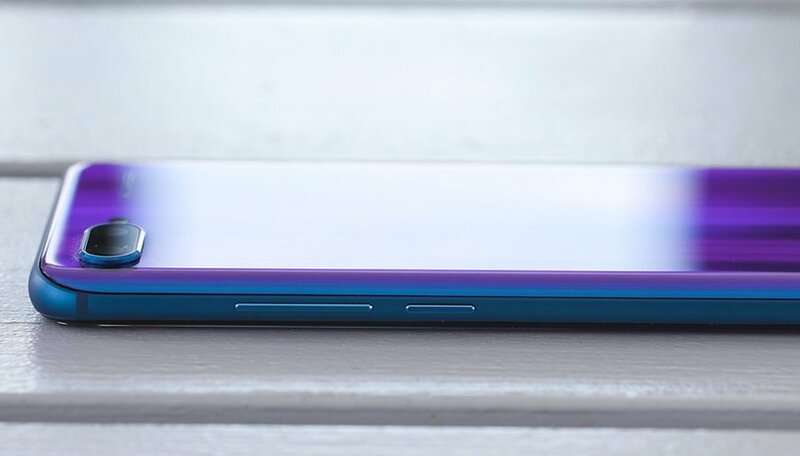 The Honor 10 is a slim (7.7mm) physically fit smartphone (153 grams) that feels good in your hand. It’s not really original. The Honor 10’s similarities with the P20 and the iPhone X are all noticeable, but the device is still fascinating. This elegant design conceals a technical data that’s worthy of a top-range device from 2018. The Kirin 970 processor, with its NPU dedicated to artificial intelligence, is supported by 4GB of RAM and 64/128GB of internal memory. The numbers sound good on paper and they don’t disappoint in practice: the Honor 10 was able to handle any type of task in our test and ran smoothly, even with multitasking and demanding games. The larger 5.68-inch 19:9 display with FullHD+ resolution offers several customizable settings for games, YouTube, videos, and TV series on Netflix. Forget about augmented reality though. The software is updated (Oreo and EMUI both in version 8.1) and is able to offer a good user experience, all with the promise of Android P, even if it’s still unclear when it will arrive. The 3400 mAh battery is average: can you live with just a day of autonomy and quick recharge? What do you your smartphone for? To manage emails, messaging post on social media, do internet searches, or to game? The Honor 10 is able to do everything without any problems. And when it comes to technology, you’ll also find a dual 24MP+16MP rear camera with artificial intelligence that automatically recognizes scenes and objects by applying the right shooting mode. I prefer to be able to turn AI effects on or off on my photos. Beautiful design, up-to-date hardware (the fact that the Kirin 970 is a 2017 chip doesn’t make you feel limited in your everyday experience), customizable software features and a price that makes the competition sweat: what other smartphone offers similar features and performance for under 500 dollars? Honor has attached the epithet ‘Intelligent Beauty’ to the device, in reference to the attractive design and the presence of artificial intelligence. It’s not easy to resist a device that is beautiful, intelligent, and not too expensive. This is also true because Honor has already demonstrated that it can make good devices: the Honor 9 and View 10 are the latest examples. No smartphone in 2018 will be able to beat the Honor 10's value for money. If you’re looking for a new high-end smartphone, the Honor 10 might be the right one. The Chinese brand has managed to put together what most users are looking for, without exceeding the 500 dollar threshold. Of course, it’s not a perfect smartphone and you’ll have to make some compromises. It all just depends on what kind of user you are. Are you ready to give up wireless charging, IP 67/68 certification, a stabilizer and microSD support? If the answer is yes, you already know what your next smartphone will be. Choose “Honor 10” or “Huawei P20”. No, I don't want this phone. As with all cheaper Chinese products will it last? Personly i doubt it. I'm still using an honor 6, its working fine although the battery is starting to pack up. So might just have to upgrade to this. I like the honor10 & the Honor view10. Both these have many premium features & both in the 500.00 dollar range. It would have been nice if the deals with AT'T & Verizon had gone thru. I think the Honor10 will give the op6 a run for the money! Neither phone is appealing ...that notch is a eye sore.....lmao stop trying to push notched phones because every single one isn't going to sell very well.....the notch is a cancer among smartphones , leave to apple to create it ( or lg apparently) whatever. Lgg7 , oneplus 6 , p20 and the gonor 10 are all going to sell poorly....NEWS FLASH NOTCH SUX. I agree the notch is kind of a pain, but if it can be hidden that would be cool. So why use it anyway, I think it's more of a compromise than an added feature!